When in Milan, order the Risotto! A visit to Milan is all about shopping, wandering through the Duomo, seeing the Last Supper, exploring the Brera and eating risotto. Whilst most of Italy eats pasta, Northern Italy is well known for its rice dishes. The Po River flows from Venice to Turin, and its’ valley is the main rice growing area of Italy. As we drove through Piedmont, we would often pass beautiful green velvet fields of rice. Arborio rice is the most common rice grown but between Milan and Turin, you will see carnaroli rice grown. This as well as vialone nano rice have a higher gluten content and are the preferred types of rice to use for risotto. The classic risotto dish of Milan is Risotto alla Milanese, a creamy saffron infused dish that is either served straight from the pot or ‘al salto’ which is lightly fried. I love it when it is served with osso buco and at restaurants such as Trattoria Milanese you can order a serve of half risotto milanese and half osso buco. Delicious. I had read about a small restaurant on the edge of Milan that specializes in risotto, so now was the time to investigate. Feeling like locals, we decided to catch the train there and ten minutes later, we found Trattoria Temperanza Da Abele, tucked away in a side street not far from the Pasteur train station. 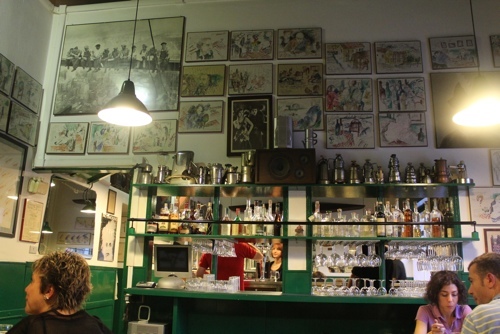 Decorated with caricatures, posters and movie memorabilia, this busy little neighbourhood restaurant exuded a relaxed and casual atmosphere and not a tourist in sight! The risotto dishes followed. We shared a risotto with mushrooms, potato and pesto and a risotto with cuttlefish, calamari, artichokes and broad beans. Perfectly cooked risotto is hard to beat! After our previous night’s success, we decided to head to the suburbs the following night and try Ristorante Piero e Pia, a restaurant that had been recommended to us by the Milanese owner of our B&B in Modica….. Taxi! The inside of the restaurant is still a mystery! It was such a beautiful night, we joined everyone sitting outside. Our starter of risotto with peas and broad beans was delicious. With two of my favourite vegetables, a hint of saffron and perfectly cooked rice, it couldn’t miss. Traditional vitello tonnato and a fabulous capretto cacciatore followed. We couldn’t resist ordering the zabaglione semifreddo and caramel sauce. A perfect finish to a delicious meal. There are rewards for detouring from the well trodden tourist paths! Do you have a favourite restaurant in Milan? It would have been great to see the rice farm and how it all worked. There’s nothing quite like a fabulous risotto! It’s always fun trying new restaurants – even better when they’re a success! No Marina- it doesn’t get much better. I love looking for new restaurants and get very excited when it all works! Milan is often overlooked for the more popular Italian cities but I always have fun there. Hope you get to travel soon! Wow! I’ve eaten quite a few risottos, but never the real thing in Italy. I didn’t know that risotto came from the north…thanks for the geographical tidbit. After looking at the pictures, I’m really hungry. Like REALLY. I always order risotto in the north and pasta everywhere else- though having said that I did have a couple of great risottos on our travels around Sicily! Good food is good food wherever you are, isn’t it! I look forward to delving more into your blog- I just spotted a couple of curries from Kerala that sounded great! Risotto alla zucca, ai porcini, agli asparagi,… so yummy! Anche io! Did you find any new fabulous risotto places? I would miss it too Marco. Milan is a a fabulous city and the risotto is the best! One of the reasons I keep going back!